Sims Quicksilver Slalom Board! Flexible Aluminum with Hardwood Core. 90kg rating. Circa 1976, 1977. 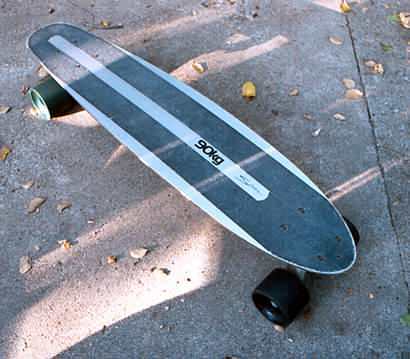 "Powell contacted Sims to see if he had any interest in the boards he was designing and, though Sims was not particularly interested, he was looking for something that could compete with the Fiberflex design." "Powell worked with his design until it was perfect. He asked former Z-Boy Rider Stacey Peralta to test it for him. Peralta was so impressed with the design and the way it bounced back when you pumped it in a turn that he offered to purchase a model on the spot. Powell deliberated leaving the aerospace industry to work on skateboards full time. His decision was made for him when he was laid off a month later, so he moved to Santa Barbara and plunged headlong into the skateboard industry." 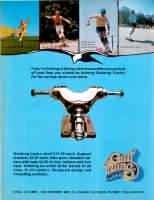 "In late 1976 Powell and Sims formally decided to market the Quicksilver ProSlalom deck. It had three different weight models the 50kg, 70 kg, and 90 kg, which offered the right amount of flex for each weight category The ProSlalom also had the option of having your name engraved on the top of the deck*, which made it custom and also helped you to identify it if it was lost or stolen. 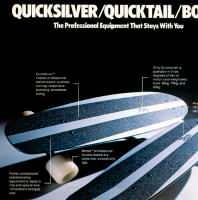 Soon after they introduced the Quicktail which was stiffer than the Quicksilver and had a kicktail." 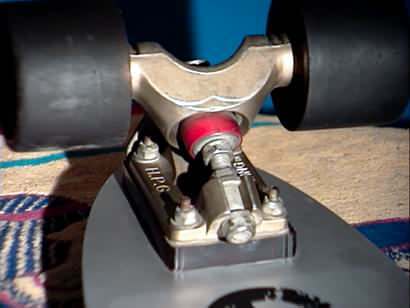 *My quicksilver, was engraved with the name of my brother's surf shop "Aloha Surf"
Close-up photos of the rare gold Gull Wing trucks. 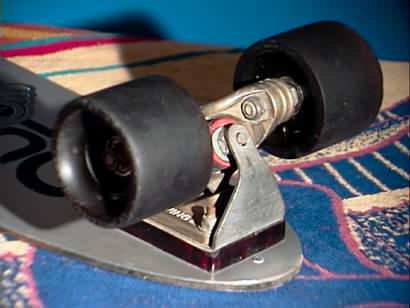 The Quicksilver was assembled in 1976 or 77 as I remember. At that time, my brother co-owned a surf and skateboard shop called "Aloha Surf", and assembled for my Birthday...the best of the best...the state of the art...the most exotic components into a world class slalom board. 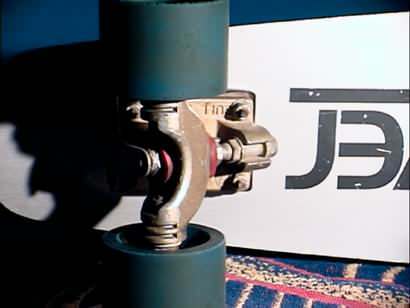 This was my main board, when I was designing the Skatepark runs for "Aloha Skatetown" in Agoura CA. I traveled with my Quicksilver, and with friends, to and from various storm drains and drainage ditches, paved streets and hills, anything smooth and hard enough to skate. Early highlights included Jungleland's deserted alligator pools in Thousand Oaks, CA, and the many first-generation skateparks throughout California. The first official skateparks I recall skating were Anaheim (near Disneyland) and Carlsbad,CA. 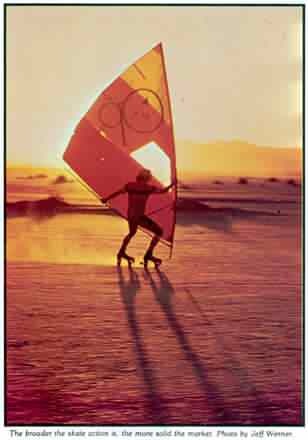 Similar to this skater with the sail below, I used this Quicksilver on various occasions with a similar sail, riding upon El Mirage Dry Lake in Ca (near the Edwards Air Force Base shuttle landing site) and in various parking lots. Speed was incredible. I was never officially clocked, but it felt comparable to riding down very step hill for stretches of several miles. "What a Rush." I never fell, as I knew it would be unacceptable to die so early in life. Sims Quicksilver - More Details and History - plus more Deck Photos! All content © 2001, 2002 R. D. Nelson. All rights reserved.